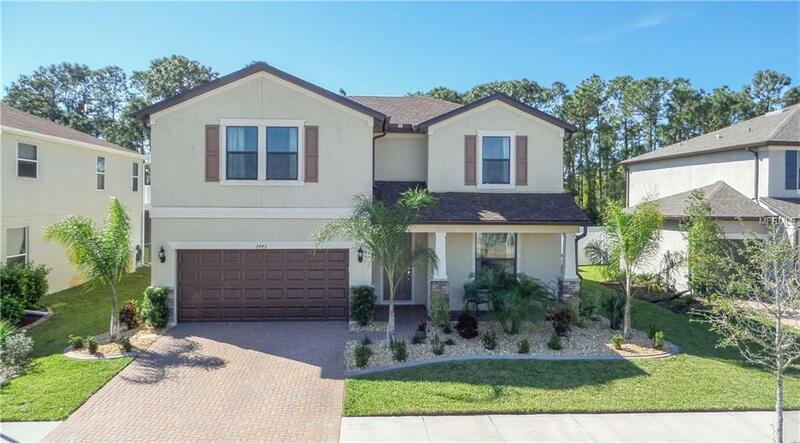 **3D TOUR** Welcome to this gorgeous 2-story home in Cedar Grove! Built in 2016, this home features 4 bedrooms, 2.5 baths, a loft & a den. Pull into your paver driveway and be greeted with lush Florida landscaping, brick enhanced exterior & a patio seating area. As you enter your new home, you will be met with french doors leading you into the spacious den. Around the corner, is the inside utility room & a half bath. Enjoy preparing meals in your gourmet kitchen equipped with granite countertops, island with pendant lighting, an abundance of counter & cabinet space, closet pantry, SS Appliances and wine fridge! The open dining room is off the kitchen with sliding glass doors that lead out to your private, screened-in lanai & large backyard w/vinyl fencing that gives you the feel of comfort & privacy. The great room has tray ceilings with plenty of natural light beaming through the large windows! The downstairs master suite has dual sinks, glass enclosed shower & an oversized walk in closet. Upstairs you will find a loft, guest bath & additional bedrooms. The other 3 bedrooms are all larger in size & each have a private walk in closet. Upgrades include: 6.25kw solar panel system enough to power the entire home, 9x11 attic storage & a Nest thermostat, to name a few. The exterior is kept lush and green by an irrigation system fed from a community pond at no cost to you! Come enjoy Cedar Grove community with it's beautiful homes, landscaping, winding walkways, plentiful lakes, community pool & playground.